When my two-year-old daughter, Emily, passed away from a tragic medication error in 2006, my primary concern as her father was to make sure that her story and the significant “lessons learned” be brought forward and that the internal systems in medicine be subsequently modified so that others wouldn’t suffer a similar fate, over and over again. 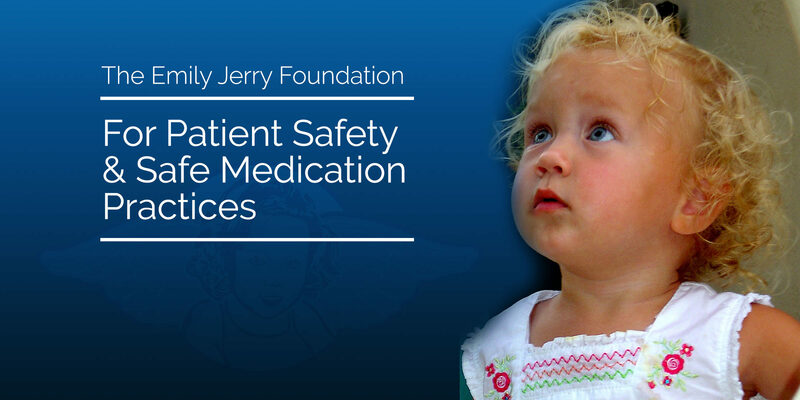 Shortly after her death, I decided to become a full-time patient safety advocate, focusing the core of my work on being an active part of the solution to preventable medical errors. When I first began to educate myself on preventable medical errors in our nation, I was astonished to find that many sources were estimating that over 200,000 people die every year in the United States from preventable medical errors. In a more recent article from the Journal of Patient Safety (September 2013 – Volume 9 – Issue 3 – p 122–128) titled “A New, Evidence-based Estimate of Patient Harms Associated with Hospital Care”, I was completely horrified to find that now, in 2013, the revised estimated number of deaths from preventable medical errors in the United States is actually over 400,000 a year! This makes preventable medical errors in our nation the third leading cause of death, only after heart disease and cancer. As Emily’s father, and more importantly, someone who has devoted the remainder of their life to being a patient safety and caregiver advocate focused on being a part of the solution, I’ve always taken issue with the simple word “preventable”. To me, the word “preventable” implies that we can, in fact, stop or impede something from happening only if we can acknowledge and anticipate that an event will occur and, consequently, implement the appropriate measures needed to “prevent” something from happening. However, with that notion in mind, in order to prevent something from happening (i.e., preventable medication errors, etc. ), you absolutely must be PROACTIVE in terms of your approach to exactly what you’re trying to prevent. This is where The Emily Jerry Foundation’s key technology partner in patient safety, Codonics, and their Safe Label System (SLS) come into play at the upcoming American Society of Health System Pharmacists Midyear Meeting, in Orlando Florida, next week. Beginning on Monday, December 8th, through Wednesday the 11th, I will be giving five minute presentations in the Codonics booth #1551 each day at 11:45, 12:30 and 1:30. There really is no better time for our nation’s great hospitals to step up and increase patient safety through technologies that can help prevent medication errors. Let’s not wait for another tragic event like Emily’s to occur. If you are attending the ASHP Midyear Meeting, I encourage you to join me to learn about technology available to help you prevent medication errors. Together, we can ensure that systems are put into place and eliminate medication errors…forever. I’m absolutely certain that many people will ask the question, “How would Codonics Safe Label System (SLS) have saved your daughter, Emily?”. My answer is this: If the facility had been proactive about modifying their systems through the implementation of clinically proven technology, similar to Codonics (i.e., bar code scanning of vials with subsequent printing of labels with accurate information of concentrations, etc.) to reduce the probability of “human error” entering into the equation during the course of treatment, I am convinced Emily would still be with us today. Bottom line, prior to my daughter’s tragic death, due primarily to the initial cost associated with the implementation of proven technology available at that time it’s my opinion that the facility was in denial that a tragic medication error like Emily’s could even actually occur at their facility. After all, they were, and still are, a leading pediatric facility in the United States. Many of the top facilities in our nation still have this underlying attitude that a horrible medication error like Emily’s could “never” happen at their facility. Bottom line, these types of errors WILL in fact occur, and statistically they will happen, it’s just a matter of when! With that being said, our nation’s world-renowned medical facilities can choose to either modify their internal systems in a proactive way, before a tragic medication error occurs, or wait to react after there has been a loss of life and a tragic event actually happens. Along those lines, I also believe that as we move forward with healthcare reform and facilities all have to do so much more with less and less financial resources, I still think that our medical facilities in the United States will make the right choices with those limited funds. After learning Emily’s story, I believe they will choose to be proactive, making the necessary expenditures in terms of modifying their internal systems with the “smart implementation” of technology like Codonics SLS in their medical facilities. I look forward to seeing you in Orlando. More than 56,000 adverse events and 700 patient deaths were linked to PCA pumps in reports to the Food and Drug Administration (FDA) between 2005 and 2009. One out of 378 post-surgical patients are harmed or die from errors related to the patient-controlled pumps that help relieve pain after surgical procedures, such as knee or abdominal surgery.